I prefer Piecemakers Embroidery needles for pick stitching with perle cotton...I almost always use #8 perle cotton. It is easy enough to thread through the eye of the needle, but thick enough to add a decorative touch to your quilt. I use either masking tape, painters tape or quilters tape to mark my stitching line. I aways tell students to use the thimble they are most comfortable with...I use a leather thimble. I have tried many types, but I have kind of skinny fingers so I have found this to be the best thimble for me. Wear the thimble on the middle finger of your dominant hand...with the stretchy part on your knuckle....YIKES! Those are my grandmother's hands - ha! I use an 18 inch hoop so I don't have to re-hoop the quilt as often. The quilt should be in the hoop snug...but not too tight...you want to be able to push up a little hill from underneath the hoop...you don't want to be able to bounce a quarter off of it! Use about 18 inches of perle cotton and put a knot at one end....begin by taking the thread just under the top of the quilt (not through all three layers) and start about 1/2 inch away from your actual stitch line...slid the needle under the top of the quilt and come up next to your tape on the stitch line...give the thread a little tug until you pop the knot into the middle layers of the quilt..this is burying the knot! Begin your first stitch by going straight down into the quilt - the needle should be perpendicular to the top of the quilt. There are several things that will happen simultaneously and you just have to practice and get a rhythm to become proficient...your thimble finger will rock the needle (eye of the needle) up and the point of the needle down into the layers of the quilt...while you take the needle down into the layers, the other hand (middle finger) will feel the point of the needle poking through and it will direct the needle back up into the layers of the quilt. While all of this is happening the top hand thumb will push down (while the middle finger underneath is pushing up) to create a little hill....this way the needle has some direction and come back up to the top layer of the quilt...your thumb on the top will feel when the needle has come back through. As you push up this little hill, the eye of the needle will rock back down and the point will be rocked up to complete the stitch. WHEW!!! I prefer larger stitches with perle cotton...a little larger than 1/4 inch...that is just a personal preference...I think it adds charm. Go back down into the hole of the last stitch and move your needle just under the top layer off to the side...come back up through the top layer...and pop the knot into the top to bury the knot. I cannot stress enough how the charm of pick stitching is that it is not perfect...the stitches are chunky and not always straight or in perfect little lines...it adds charm and whimsy to your quilt...I love it! Thank you so much for posting this tutorial. I am so drawn to that look, and yet not real good at it. Also, I noticed that you used your middle finger. I tend to favor my index finger and before you know it, it gets a bit sore. Also, a thimble makes me feel clumsy. Have you always used a thimble? I began quilting over 20 yrs. ago...first learning on my own and then taking classes. I did take several hand quilting classes and joined guilds to expand my knowledge. I have always used the middle finger (this is the way I was taught) and I have always used a thimble. Way too painful without. Thimbles are tricky...I just can't get used to anything other than a leather thimble. I do a lot of hand quilting so I'm sure it is just what I have become comfortable with. I am sure there are tons of options though...you could even wrap your finger with band-aids...you just don't want to keep poking your fingers over and over again...not good for the fingers! Fantastic Monika...let me know how it is going. Awww...thanks Adrianne. Please, let me know how your project is going! I would love to see it! 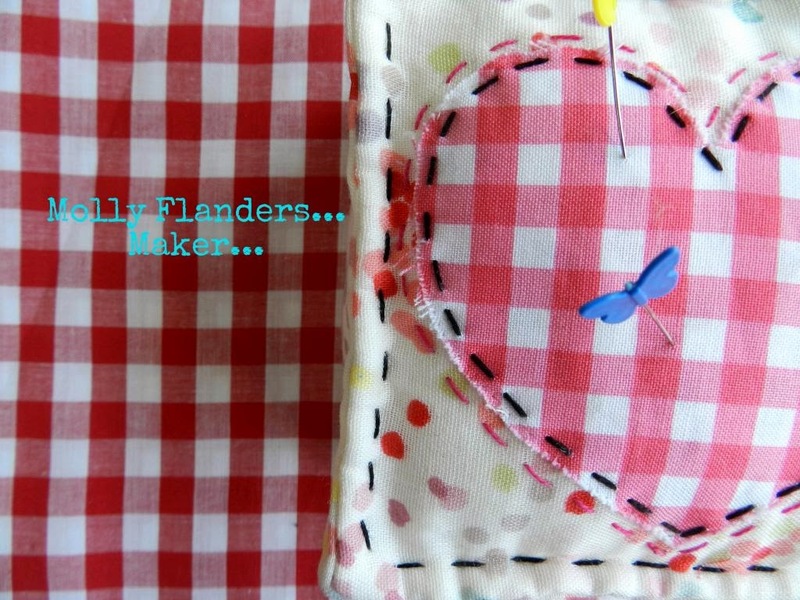 Thanks for the tutorial Mary, Im trying to Pick stitch a quilt at the moment and having a heck of a time, Its linen on the front and back, which I think must be my problem, I might see if I can get my hands on a leather thimble, do you think that might help? Hi Kelly...my quilt is linen as well...both front and back. Although it is quilter's linen. Can you pin-point the problem that you are having? I find that most people starting out have a some difficulty getting used to the thimble on the middle finger and the whole rocking motion. I really like a leather thimble...I wish I could just hand you one to try out! I have tried many different thimbles and this is the only one I have had luck with. Remember to go straight in with the first stitch and you need that hand underneath to feel the point as it comes through and push the needle back up. Take it slow...no need to rush. Keep your hand in that C position and remember to rock the needle. Let me know how it is going...you will get it! If it just seems too foreign you can always just stitch all the way down through layers and pull the thread through and then back up again from the bottom...that just takes a bit longer to finish a project. Hi Mary, sorry its taken me so long to reply. thank you mary for explaining that so well. i have a neighbor that showed me this but she did it so fast that i did not catch anything but how to start and pop the knot through. i will try again as i have an entire quilt that HAS to be stitched this way. unfortunately i did not buy perle cotton. thanks again. maybe i will not hate handwork now. Thank u for taking the time to make this tutorial. I will be trying this in the new year! Your work is so beautiful! Such a cute idea! I've seen this on your blog and other blogs but am glad now to know how its done! Maybe I'll play it safe and try it on a pillow first :) Thanks for the sharing! I'm just reviewing this again. I am so excited I bought a hoop, thimble, needles and perle cotton today. I just have to finish some machine quilting on the quilt (it is a large throw so I thought for my first time hand quilting that maybe I shouldn't try to hand quilt the whole thing)and then I can get started! Hopefully I will tomorrow. Your blog has really inspired me. I know I have said that before but it really does. Your quilts and Sarah Feilke's quilts are my favorite. Thank you for writing these great directions. I have always been so focused on the patchwork. It is really fun to get more into the quilting part. Thank you for posting this tutorial. I have been afraid to try this for years, thinking that there was no way I could ever get my stitches to come out half-way even. I was also afraid of pulling a big knot through the fabric and making a hole in the fabric. Well, I got up the nerve after seeing your tutorial, and I can't believe it. My stitches are beautiful, the knots haven't made any holes in the fabric, and the big stitches add so much to my quilt. I'm hooked! Bless you!